We have been using Windchill 10.2 for a while now along with Creo 2.0. Creo file management has been working fine. Today we no longer seem to be able to upload parts. When I try I get "Upload failed" and "See the Event Management console for details". When I go to the console it is blank and provides no additional information. Transaction aborted when accessing versioned row in table 'first.QueueEntry' in database 'first'. Requested versioned row was not found. Your tempdb is probably out of space. 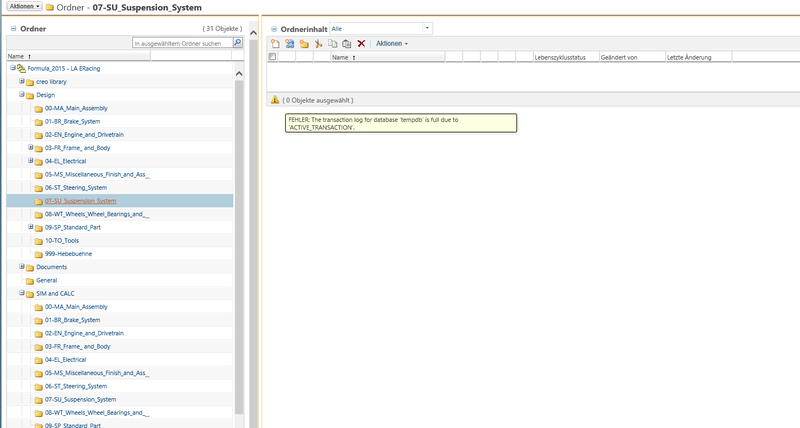 Please refer to BOL on how to configure- tempdb for versioning. Our Team has the same problems. And we have one folder were all files are gone. Our FTC team is having the same issue. The folder where our parts are stored is showing 0 files. Can you check the options tab of your check in form and make sure Associate Parts is not selected? There is no need to create Windchill parts as part of the Check In process. This option should be off by defualt in your project and your workspace. I have also put in a request for the administrative team to take a look at the error message and determine if there is a DB issue. I was able to check in new parts today without any errors. Please let me know if you are still having the same issue. My team have a great problem by checking in parts. Always we would do it, the folowing error message shows up: "Action cannot be completed as it cannot build association with Part that you do not have access to." The error message is telling me that somewhere along the way or during the check in process you have created or are attempting to create Windchill Parts to associate with your CAD files. Do you see any files in your workspace identified by a gray gear as shown below? These files should not be created and should not be checked into your project. There is no need for them. If the problem continues, please send me a PM with the name of your project and some details about the problem files, workspace, etc. We are good. It came back up. Is there a way to make a local backup just incase we loose ability to log on? Yes, the method I always recommend is to open your full assembly in Creo and then use the Save As option to create a ZIP. Select File, Save As >, Save a Copy, change the Type to "Zip File" and select OK.
You can also create a full backup of the assembly and all its dependents using the File, Save As >, Save a Backup option too. I always create a new folder for the Backup and typically name it with a date. Then you'll have a good local history of the assembly and files you've been working on. Thank you. We Stated with PTC last season and the kids know quite a bit more than me. Adding the use of windchill this year has simplified a lot but came with questions. They have adjusted and it has helped wtih their desgin process.